Single software and hardware complex ISIDA-8 is mounted on one chamber of the incubator, "the UNIVERSAL - 50/55". All the complexes ISIDA-8 are United in a local network and connected to a personal computer. User-friendly software allows you to remotely control and monitor parameters of the microclimate in the incubator. Electronic relative humidity sensor (with accuracy ±3,5%). Also, for the measurement of relative humidity, ISIDA-8 can use a psychrometer consisting of dry and wet temperature sensors. The system automatically adjusts its operation to the available set of sensors. a) closed heating elements with a capacity up to 6000 Watts. C) the high-pressure pump with spray nozzle. a) flap of the air circulation system. a) the mechanism of rotation of the trays. Measures and regulates the relative humidity. Measures and regulates the concentration of carbon dioxide. Additional channel for auxiliary equipment. Counter of rotation of the trays turning mechanism. Monitoring of the rotation of air circulation fan. Monitoring of the status of the cell door. Counting the cost of electricity for the entire incubation period. New generation of system management module ventilation. Sub-diagnostic program of in-circuit faults. Light and sound system of notification of accidents. A special program of remote monitoring and controls "ISIDA-8". The time generated by the timer at each position 1 min. up to 999 min. The maximum power connected to the output of the heater not more than 6000 Watt. The maximum power connected to the output of the humidifier not more than 500 Watt. The maximum power connected to an additional output not more than 500 Watt. The maximum power connected to the output trays turning mechanism not more than 500 Watt. 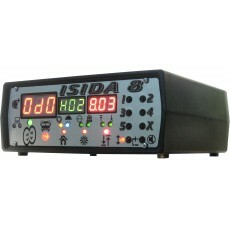 System unit "ISIDA-8" 1 pc. Digital temperature sensor 2 pcs. Monitoring of the trays turning module. Monitoring of the low-speed fan module. Supports simultaneous connection up to 30 complexes "ISIDA-8"
Continuous automatic control of incubation parameters (temperature, humidity trays turning). The user can view the temperature and humidity of graphics in real time. Save and export the log data in various formats from all connected temperature controllers. Automatically send e-mail og the the log data in the user-specified intervals. Automatically send SMS messages to mobile phone specified by the user.